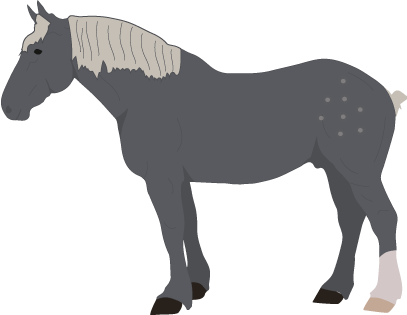 Polysaccharide Storage Myopathy Type 1 (PSSM1) is a glycogen storage disease that occurs in horses who have inherited the genetic mutation as an autosomal dominant trait from breeding parents. Only one parent needs to pass the genetic mutation to its offspring for signs of tying-up to occur. The mutation causing PSSM1 is a point mutation in the gene that codes for the skeletal muscle form of the glycogen synthase enzyme. The mutation causes this glycogen synthase enzyme to be overactive, increased in activity especially in the presence of insulin resulting in constant production of glycogen. When glycogen is being produced the reciprocal breakdown of glycogen is impaired potentially resulting in a deficit of energy in the muscle cell. 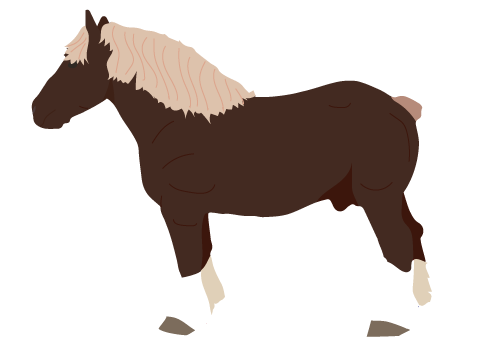 Certain horse breeds are more at risk of developing PSSM1 than others. The genetic mutation is rare to nonexistent in breeds such as Arabians, Thoroughbreds and Standardbreds. Warmbloods are more prone to developing PSSM2, and only account for less than 10% of cases of PSSM1. The following table describes the number of randomly samples horses that tested positive for the PSSM11 mutation out of the total number of horses tested as well as the % of horses that were positive for the mutation (prevalence). Firm, hard muscles, particularly over their hindquarters. Muscle Biopsy - Muscle biopsies must be taken, prepared, and shipped in accordance with specific instructions provided by the Equine Neuromuscular Diagnostic Laboratory (NMDL), a diagnostic laboratory located at Michigan State University in the United States. Once the NMDL receives the samples to be biopsied, the samples are processed once per week and read out within 10 days unless an expedited request is made. Genetic Testing - Performed on whole blood samples or hair roots of suspected horses, which are submitted to the University of Minnesota Veterinary Diagnostic Laboratory for a specific genetic test available. 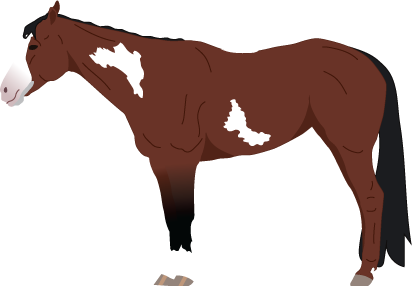 If a horse has just experienced an acute tying up episode, reintroduction of exercise should be made very slowly consisting of light, slow uncollected work on a longe-line or under saddle beginning with once a day for 3-5 minutes at a walk and trot. Exercise should not start until 2 weeks after appropriate diet modifications are made. Once exercise has started, it needs to be done on a consistent basis, with minimal days without some form of exercise is given. Exercise duration is the most important aspect, rather than intensity of exercise. This initial work should be very mild and very short in duration. Work at a walk and trot can be gradually increased by two minutes each day. 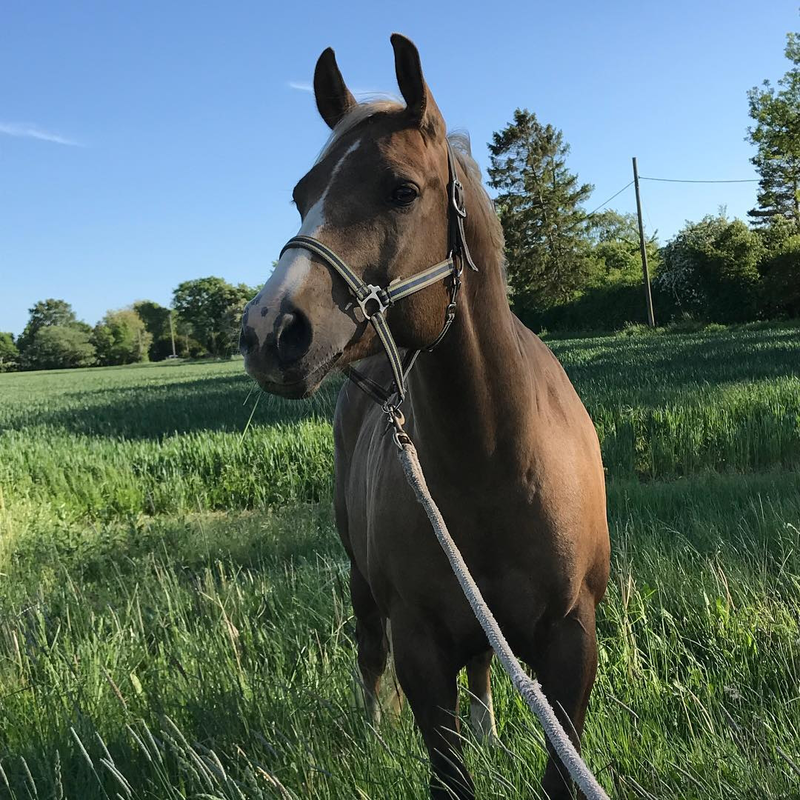 When the horse can exercise for 15 minutes, a five-minute break at a walk can be provided, and then a few intervals of walk and trot can gradually be increased. At least three weeks of walk and trot should precede work at a canter. Horses diagnosed with PSSM1 require some lifestyle changes in order to help manage their condition and prevent tying-up episodes from occurring. These changes are related to diet, management (turnout), and exercise---each being equally important for horses with PSSM1. Diet: Switch to a low starch/sugar diet initially before adding fat, which should be introduced gradually, over several weeks. Suitable oils include soybean, corn, safflower, canola, flaxseed, linseed, fish, peanut and coconut. The amount of oil can be added gradually monitoring the horses exercise tolerance and weight. The amount added is usually between 1/2 and 2 cups. If horses don't like the oil, rice bran (15-20%) can also be used as a substitute. However, if rice bran is added then other dietary modifications will need to be made to ensure that the horse's calcium: phosphorus ratio is adequate, since rice bran contains excessive phosphorus levels relative to calcium. Once adjusted, switch horses to a, low starch high fat diet. Ref: S Valberg. Polysaccharide Storage Myopathy. AAEP. 2006. Management: Horses with PSSM1 should be turnout as much as possible, ideally 24/7 with other horses in a low stress environment. Exercise: Daily exercise is an extremely important aspect for managing horses with PSSM1. Even 10 min of exercise has been shown to be extremely beneficial in reducing muscle damage with exercise. Once conditioned, some PSSM1 horses thrive with 4 days of exercise as long as they receive daily turn out. For riding horses with type 2 PSSM1, a prolonged warm-up with adequate stretching is recommended. Rest periods that allow horses to relax and stretch their muscles between 2 – 5 min periods of collection under saddle may be of benefit. Management Changes Horses with PSSM1 should be turnout as much as possible, ideally 24/7 with other horses in a low stress environment. Diet Modifications Switch to a low starch/sugar diet initially before adding fat. Suitable oils include soybean, corn, safflower, canola, flaxseed, linseed, fish, peanut and coconut. The amount of oil can be added gradually monitoring the horses exercise tolerance and weight. The amount added is usually between 1/2 and 2 cups. 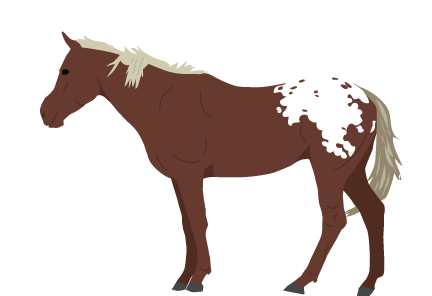 Once adjusted, switch horses to a low starch high fat diet. Exercise Is an extremely important aspect for managing horses with PSSM1. Even 10 min of exercise has been shown to be extremely beneficial in reducing muscle damage with exercise. Once conditioned, some PSSM1 horses thrive with 4 days of exercise as long as they receive daily turn out. For riding horses with type 2 PSSM1, a prolonged warm-up with adequate stretching is recommended. Rest periods that allow horses to relax and stretch their muscles between 2 – 5 min periods of collection under saddle may be of benefit. Antioxidants Supplemental vitamin E (1-6 IU/kg/day alpha-tocopherol) and selenium (1-2 mg/day) added to feed can help if deficiencies have been confirmed. Avoid feeding horses a diet high in starch, such as sweet feed, corn, wheat, oats, barley, and molasses. Provide any extra calories needed in the form of a fat, such as dietary oil. 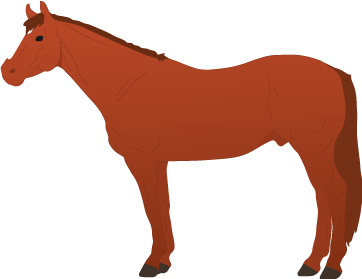 Genetics - certain breeds of horses are more at risk of PSSM1. Horses just beginning initial training or just starting to exercise after a lay-up period with reduced turnout.